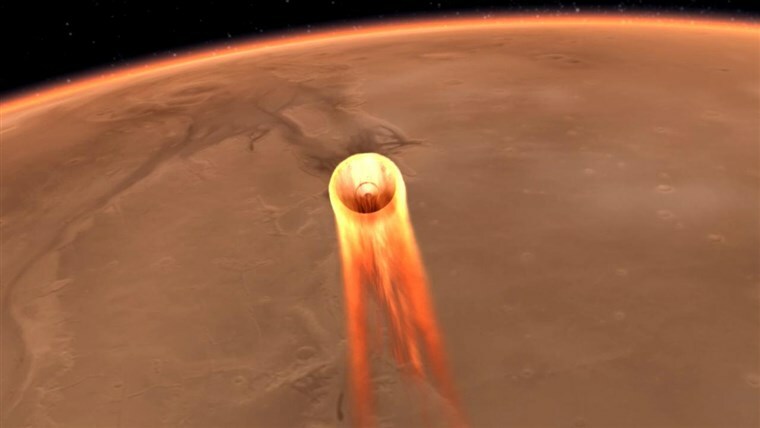 NASA's InSight spacecraft just landed successfully on Mars. It took a six month journey across 300 million miles. The lander carries breakthrough equipment that will burrow deep into the Red Planet's surface. This has never been done before. Space X's Elon Musk believes in upcoming years he will have a 70% chance of moving to Mars. InSight's landing was perfect. But Mars isn't the best place to land. The 3-legged spacecraft had to decelerate from 12,300 mph to zero in 6 minutes as it pierced the Martian atmosphere. The 600 pound stationary lander has a 6 foot robotic arm that will place a mechanical mole and seismometer on the ground. The mole hammers down to 16 feet to measure the planet's heat and the seismometer listens for any quakes. Nothing like this has been done before on Mars. Musk's Space X has designed a spaceship for interplanetary travel. It's called Starship (formerly BFR). If you want to travel to Mars and possibly colonize it, the cost for a Musk flight is "a couple of hundred thousands dollars".